It doesn’t take long to realise Platinum Games were up against a very tight schedule with this Nickelodeon tie-in. For us, that moment became all too apparent when being ushered down one narrow corridor to next in order to fight yet another bunch of identical enemies. Platinum’s experience with the scrolling brawler genre – for want of a more exuberant description – is still evident, thankfully. Able to block, counter and dodge, Korra herself is responsive to control and once her diminished powers are fully resorted it’s possible to fill the screen with all kinds of elaborate elemental attacks. Stone columns erupt out of the ground, fireballs fling all over the place and giant whirlpools sweep up any hapless foes that get in their way. Platinum certainly nails the sense of Korra’s unsurpassed power, if nothing else. While fans may find resorting Korra’s powers to their fullest enticing – initially at least – the explanation of why they have become stripped in the first place is paper-thin. To wit: a mysterious man took them. After a brief opening sequence what then ensues are eight increasingly dull chapters in which Korra tries to work out who this man is, while tracking down his whereabouts. Failing to set the pace, the first mission is set in an evacuated city. It’s as dull as can be, with paths so tight that there’s absolutely zero chance of exploration. Throughout set-pieces are few and far between and although there are ‘hidden’ chests to find they’re often placed behind breakable walls so large that they’re impossible to miss. 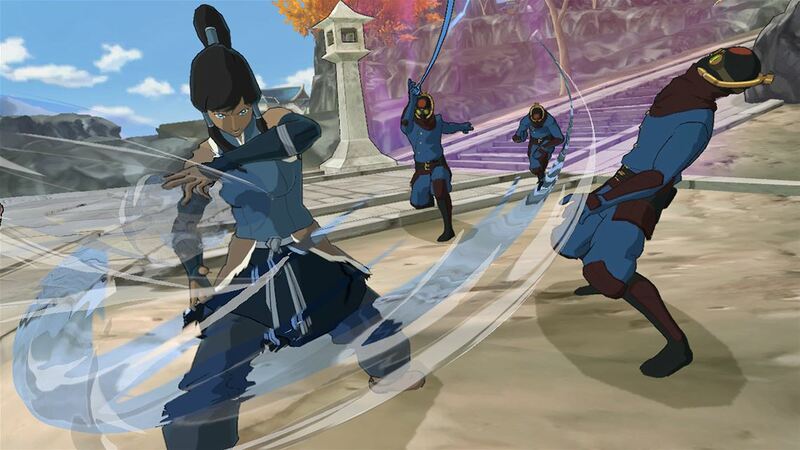 The majority of Korra’s lost powers awaken during the surprisingly tough bosses battles. Through use they automatically level up, requiring less ‘chi’ to use. It’s also possible to earn XP quicker by purchasing and equipping Talisman, albeit at the cost of half the attack power or a greatly reduced the health bar. Even with these Talisman equipped though it’s highly doubtful that players will manage to get Korra back to her deadliest during the first playthough. Why, this almost seems deliberate. Could it have anything to do with the fleeting three hour runtime, perhaps? A few chapters take the form of auto-running sections, in which Korra rides polar bear/dog hybrid Naga. Resembling mobile hit Temple Run, the idea is to jump and slide under various obstacles while collecting the glowing orbs that lead the way. A change of pace is welcome here as much as it is in any game, but aside an achievement for completing a chapter without crashing into anything there’s no reason to return for a second play. Pro-bending matches serve as a better distraction, with a full tournament unlocking once the adventure (to use a word lightly) is complete. The AI of the two other Pro-benders that accompany Korra is pretty good – losing a match is rarely their fault. We’d even go as far as saying that the inclusion Pro-bending saves the package from verging on disastrous. 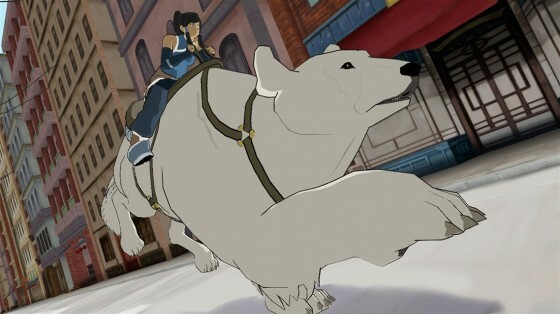 Why The Legend of Korra hasn’t turned out to be particularly good is no mystery. Platinum was clearly up against with a tight schedule, and quite possibly faced with a lack of resources too – Wii U-exclusive Bayonetta 2 launched the same week. What is a mystery, however, is whom it’s aimed at. There’s no engaging side-story for Korra fans to take in, while the difficulty spikes that occur with every boss battle makes it too challenging for younger players. Adding to the frustration, dropping the difficulty level at any time resets all progress. We understand a few players learned this the hard way. Following in THQ’s footsteps, Activision too have overlooked the potential of the Avatar series, favouring to make a quick buck instead. The result is a blotch on Platinum’s otherwise impeccable record.